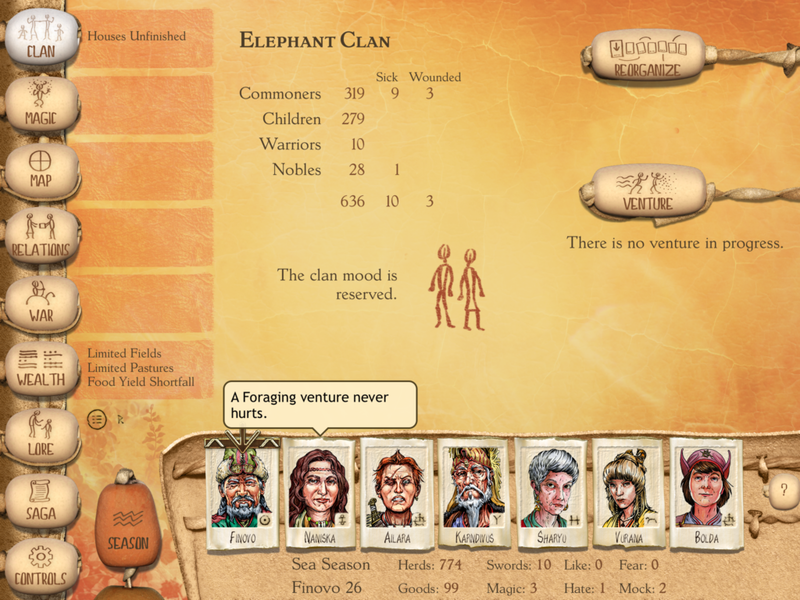 Six Ages: Ride Like The Wind is a gamebook — an interactive story about leading a clan in a world of myth and magic. 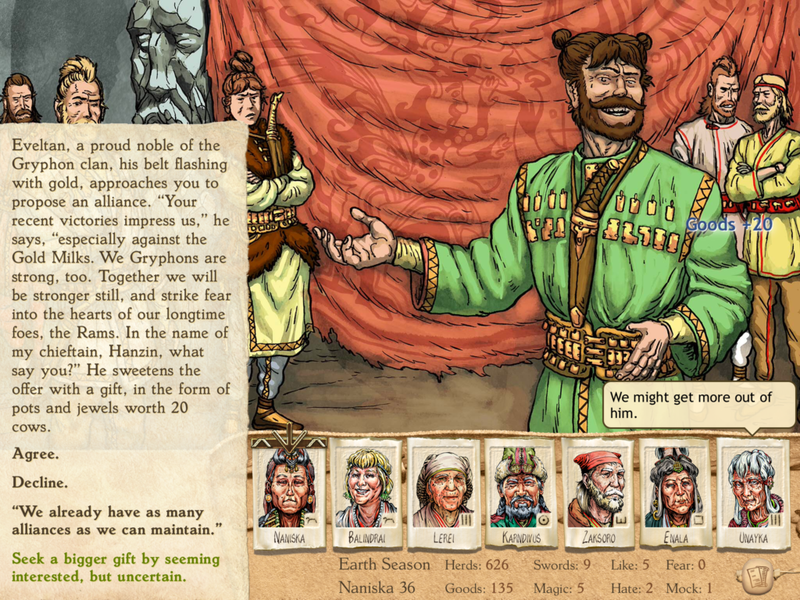 Alongside its predecessor, King of Dragon Pass, Six Ages is almost unique in its intersection between storytelling and a resource-management game. And like King of Dragon Pass, Six Ages brings its setting to vibrant life, encouraging the player to stay in-character in a world where the divine is never far away. Six Ages’ design goals are clearest in the rituals in which you send a hero into the gods’ world to seek a boon (in a clever touch, the mortal and divine worlds are drawn in different styles and by different artists — see the image below). 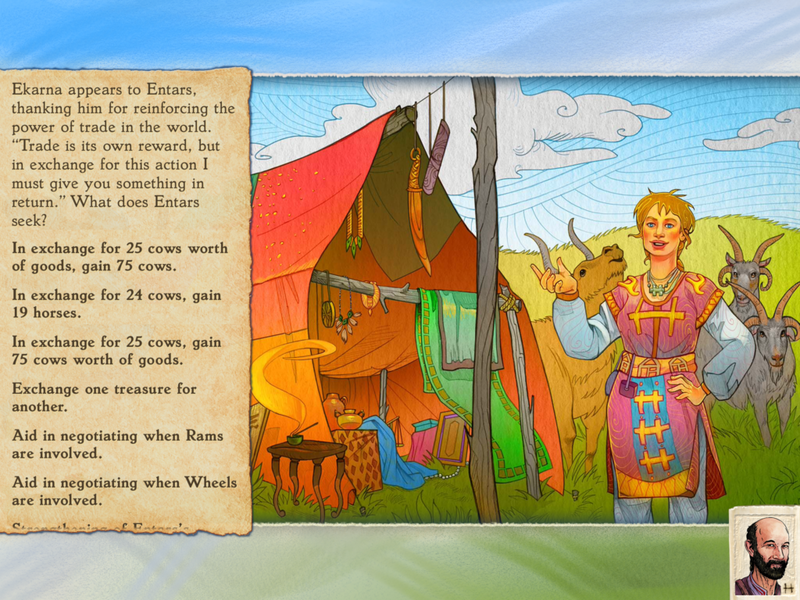 The ritual unfolds as a reenactment of the chosen god’s myth, Choose Your Own Adventure-style: how should Ernalda, goddess of trade, win the trust of geese? What should Busenari the cow-mother ask from her counterpart the horse goddess? Your clan can do several things to prepare, for instance, allocating points to ritual magic, requesting worshippers from friendly clans, and sending the right hero. And you, the player, can prepare by going to the game’s “lore” section and reading the myth. It’s not a test of rote knowledge — I have succeeded by going off-script, and I’ve read a developer interview (linked below) indicating that these quests were designed to be flexible. At the same time, I would not go in blind, and the act of reading and preparing brings me one step closer to the characters and the world they inhabit.